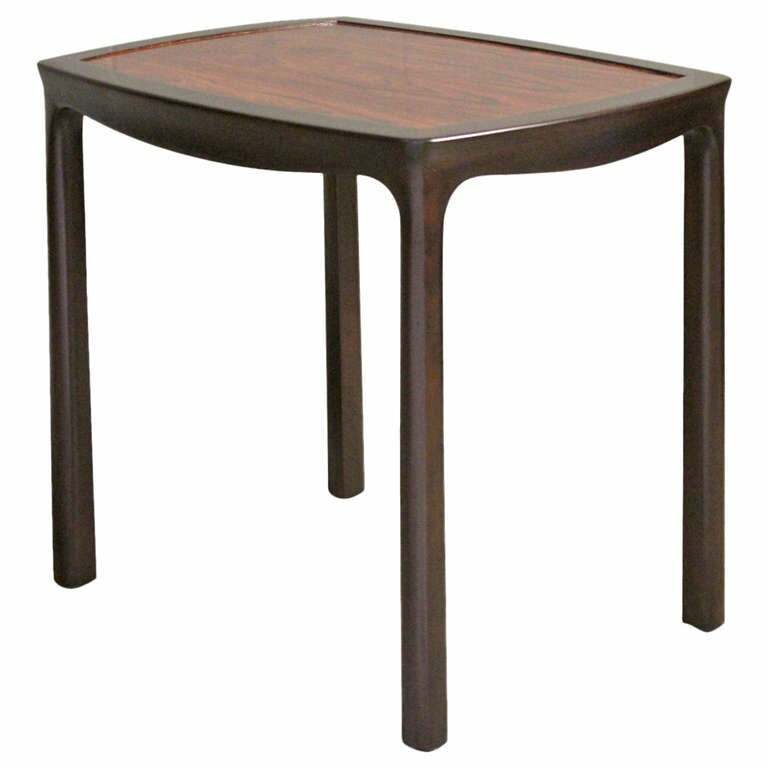 A large scale dark mahogany side table with rosewood top. Designed by Edward Wormley for Dunbar. A stone top Janus side table with mahogany and brass base. Designed by Edward Wormley for Dunbar. A "Sheaf of wheat" side table with travertine top. Designed by Edward Wormley for Dunbar. A large scale side table with burl top and ebonized base. Attributed to Edward Wormley for Dunbar. An early set of three nesting tables in original lacquer. Designed by Edward Wormley for Dunbar. Pair of ebonized rosewood and mahogany end tables by Edward Wormley for Dunbar. Signed. USA, circa 1950. Dimensions: 28 inches L 21 inches W 23.25 inches H.
Constellation occasional table by Edward Wormley for Dunbar. Literature: Dunbar, manufacturer's catalog, 1962, unpaginated The tabletop measures: 12.88" diameter. Edward Wormley side table for Dunbar. The scarcer form with two-tier tabletop. Wormley for Dunbar, custom table uses "Long John" surface crating a unique wedge table. Measure: Tapers from 27 inches to 15 inches, depth along the edges is 27.5. A pair of Parsons style end tables designed by Edward Wormley for Dunbar Furniture company. A walnut 'Janus' end table of Asian inspiration, with raised edges to the legs and diagonal cloud-lift stretchers. Accented with green inlaid ceramic tiles.